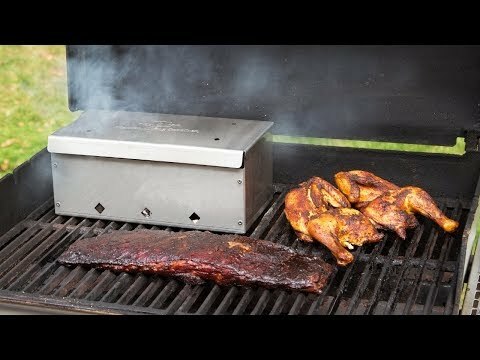 This BBQ smoker box makes smoking meats and fish easy because it works inside any type of grill. 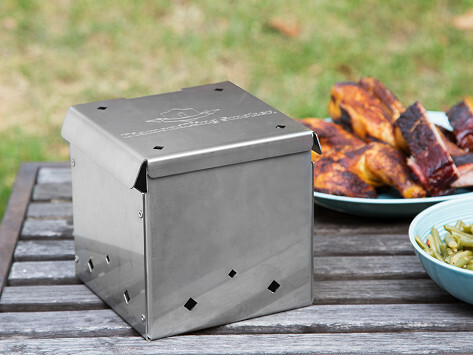 All you need (besides the grill) is your protein of choice and the box takes it from there, cooking ribs, chicken and more to smoky, tasty, doneness. Dimensions: Rectangle: 13" x 7" x 6"; Square: 6" x 7" x 6"
Weight: Rectangle: 6 lbs. ; Square: 3 lbs. Bought as early Christmas gift for hubs. He was thrilled! Great size - going to smoke a brisket! The Grommet site does not disappoint. Great unusual yet useful products at affordable prices. This smoker is very well-built and works like a charm. The company is very responsive to queries and the wood and starter material is the best.